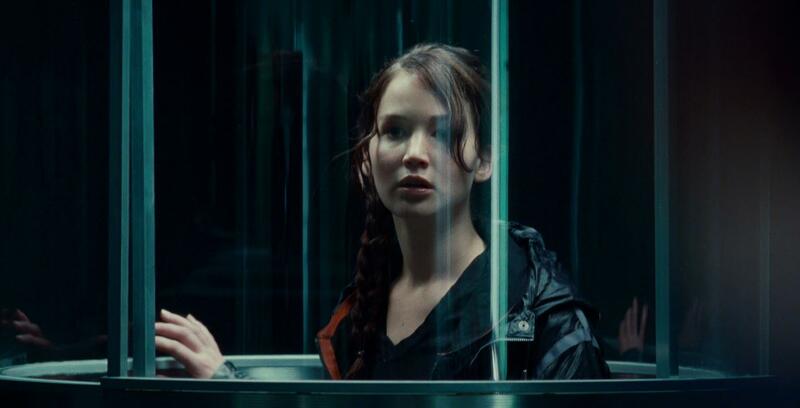 Katniss Everdeen: Wanna see what I got you today? It's a mockingjay pin. As long as you have it, nothing bad will happen to you. I promise. It seems like The Hunger Games could have easily been a huge disaster waiting to happen, regardless of the monetary success it becomes in its opening weekend. The film is based on another popular book series, geared more towards a teenage audience, featuring a familiar narrative, with a romantic angle added on to boot. We are already seeing crowds go wild and chanting things such as, “Team Peeta,” which could easily come off as nonsense to those unfamiliar. Thankfully, this heavily anticipated film is pretty damn entertaining. Given the strong lead performance, solid handle on bringing the source material alive, and maintaining a certain level of excitement throughout, I was very happy to be thoroughly pleased by the results and more interested in reading the other two books in this series. Now regardless of whether or not one has read the books, I think there is a lot to enjoy in this film, especially given the crazy amount of hype it has to live up to. Some flaws aside, this could be the start of a new franchise that is both well crafted and worthy of such high fan reaction. Let me get through some set up here: The film is set around 100 years in the future. North America has fallen to ruins and now exists as the nation of Panem, which is split into districts, and is led by a controlling city known as the Capitol. 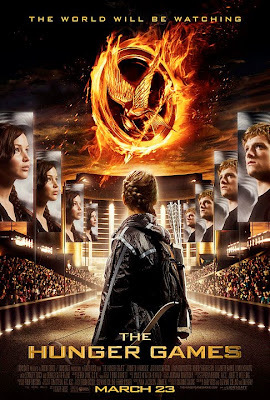 Due to an unsuccessful uprising, all of the districts are now forced to suffer a punishment that has morphed into popular live broadcast of a yearly competition, which pits one boy and one girl (between the ages of 12-18), from each district, against each other in a fight to the death. 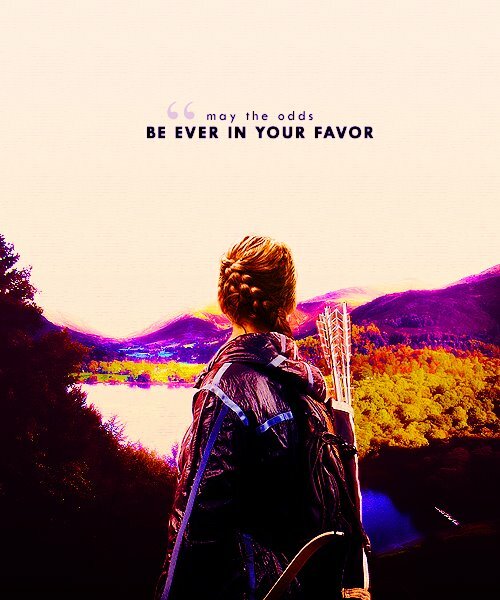 This competition is known as the Hunger Games. There is only one winner in these games, who goes on to receive fame and fortune, in the wake of the other 23 deaths that have occurred. 16-year old Katniss Everdeen (Jennifer Lawrence) lives in District 12 (one of the poorer districts) and on the day of the drawing (known as “the reaping”) for the next Hunger Games, she volunteers in place of her 12-year old sister, Prim, whose name is initially drawn. Katniss, along with Peeta Mellark (Josh Hutcherson), the boy who was chosen, are then forced to head for the Capitol, leaving everything they know behind. Once in the Capitol, before the games begin, Katniss and Peeta must deal with gaining popularity from those who bet on the games, while also training and putting on a display of their skills. 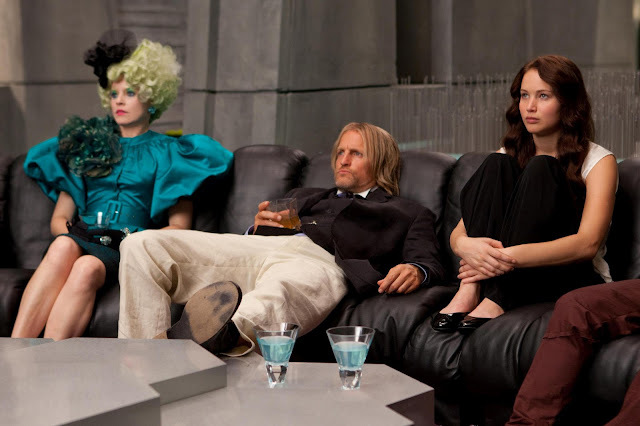 Helping their cause is Effie Trinket (Elizabeth Banks), their chaperone; Cinna (Lenny Kravitz), a stylist; and Haymitch Abernathy (Woody Harrelson), a previous winner of the games and the mentor for Katniss and Peeta. As the Hunger Games require a level of skill, while also showing the importance of providing a good show for audience (everyone is forced to watch), Katniss will need to rely on her abilities (which includes her prowess as an archer) in order to hopefully come out alive. I don’t want to be the guy that keeps referring back to the novel and how the movie went one way, while the film did the other. So to that extent, I will just try and keep those thoughts simple. I found the film to be a successful adaptation, utilizing the source material properly enough to convey the same story cinematically. While there are a number of various omissions and changes, there are also some additions that I think do well in further expanding on the world and getting across explanations of certain details in other ways beyond simply having Katniss explain everything (given that the book is told entirely from her perspective). So in this regard, I would say that while neither the book nor this film is perfect, I think they both complement each other quite well. Now, speaking (hopefully exclusively) about the film, the best thing about it is Jennifer Lawrence’s performance as Katniss Everdeen. Already an Oscar nominee (Winter’s Bone), Lawrence brings it just as good in a much larger, spectacle film such as this, as she did in that Ozarks noir. The vast majority of The Hunger Games is based around her and she sells this character, who is forced into a literal live-or-die situation and must make do with what she has and what she is capable of. Early on, Lawrence sells her role as an unfamiliar figure entering a lavish world, only to later show off a sense of assuredness in the wild, as she faces off against the others. Throughout all of this, it is easy to see the persona of an independent survivalist, whether she needs to prove herself to the gamemakers or simply work to survive amongst cutthroats. 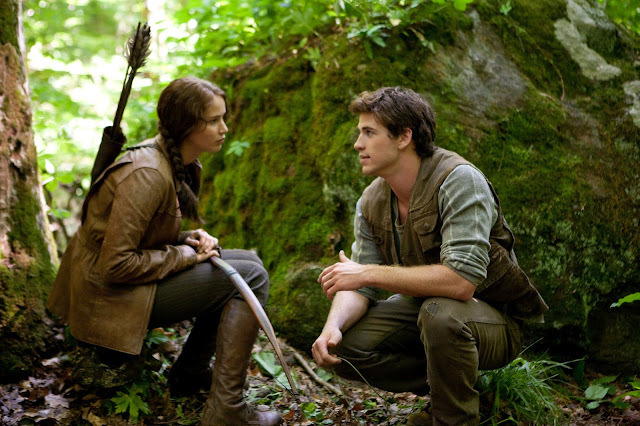 Gale Hawthorne: Okay, listen to me, you're stronger than they are. You are. They just want a good show, that's all they want. You know how to hunt. Show them how good you are. Additionally, the various other actors that appear in this film are mostly well placed. Of all of the older actors we see, Harrelson gets the most to do, as he plays the Obi Wan of the film. Harrelson is always fun to watch and he gave this film the amount of levity that it needed in spots, given the fairly serious tone. I also quite liked Lenny Kravitz in his role as the stylist for Katniss and Peeta, mainly due to how well I though he sold his positive reassurance during his scenes with Lawrence. There are smaller roles filled out by Elizabeth Banks, Wes Bently, and Donald Sutherland, but I have a feeling their gaudy outfits and hairstyle choices are more of a takeaway then what they have to provide in the film as actors. Good thing we get a nice dose of Stanley Tucci to liven things up, as he steps in as the Ryan Seacrest of this children death-a-thon. 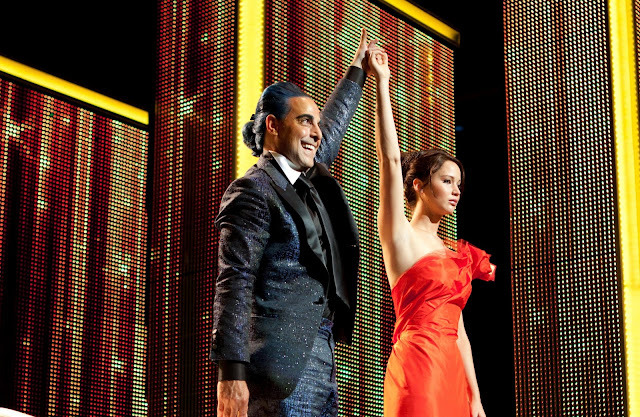 His character, Caesar Flickerman, is delightful to watch, mainly due to how it’s fun to watch Tucci chew up the screen, while wearing a wig that stands so blue and tall. 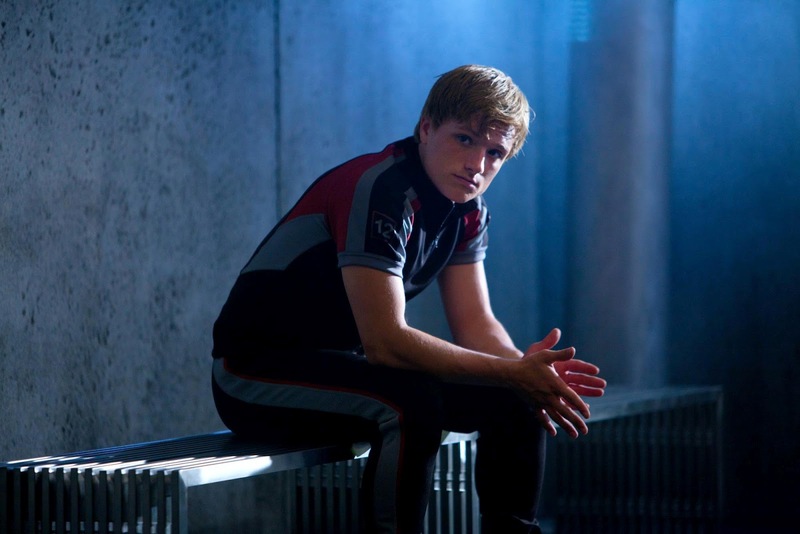 Hutcherson is a key role, as he is ostensibly the male lead and love interest of the film. While he is good enough for what this film requires of him, I think it is a testament to how good Lawrence is, that he comes off as not too important. Nor does Liam Hemsworth as Gale, the boy Katniss leaves back in District 12, who watches as she and Peeta get fairly close to each other, during the games. Still, Hutcherson does have some moments, establishing his nature and what he is capable of, but it seems quite apparent that he has come off weaker in this film than some may like. The Hunger Games was directed by Gary Ross, who previously directed Pleasantville and Seabiscuit, along with being an Oscar nominated screenwriter for a few other features. I was not sure what to expect with the decision to have him working on this film, but I really appreciated a lot of what he was going for. Ross also co-scripted the film with Billy Ray and the author of the series, Suzanne Collins. It seems like these combined efforts did a pretty fine job with achieving the intended tone, even when the film stumbles in some areas (which I will get to). In regards to Ross’ direction, once again, I think he managed to find a good balance of bringing out the drabness of the world Katniss comes from, the lavishness of the Capitol, and the stark and intense nature of the actual battleground for the games. Ross goes for an up-close and personal touch with a lot of his camera work, which is chaotic at times, but seemingly fitting in others. And the way he and his crew managed to build the sense of this world that these characters exist in was done well enough to have me curious to learn more. To speak of the action in this film (basically once the games begin), there is a definite sense that Ross is just starting to get his feet wet with how he should handle it. This is basically his Batman Begins, as he puts the camera very close to all involved, very much on purpose, in order to convey that sense of chaos and uncertain terror, as kids who have both been trained to kill and thrown into an impossible situation are forced to fend for themselves. It works in a key sequence early on, but the further into the film, the more distracted I was with how the action was handled. I can only hope that the future entries in this series find Ross settling into a better defined groove of how to handle the action. Still, given that this subject matter could have gone decidedly darker, I was pleased enough with how it stayed within the realm of a PG-13 zone, while not flinching too much when it came to the whole “children dying” aspect of the story. Speaking of the subject matter, it is easy to acknowledge the story of The Hunger Games as a parable and as an allegory in regards to themes of government control, poverty, the effects of war, the role of reality television, etc. While one can certainly see that the film acknowledges that these themes are present in the story (Ross has proven in the past that he’s more about making an effective an entertaining film, regardless of subtlety), there did not seem to be much of an attempt to really explore them. 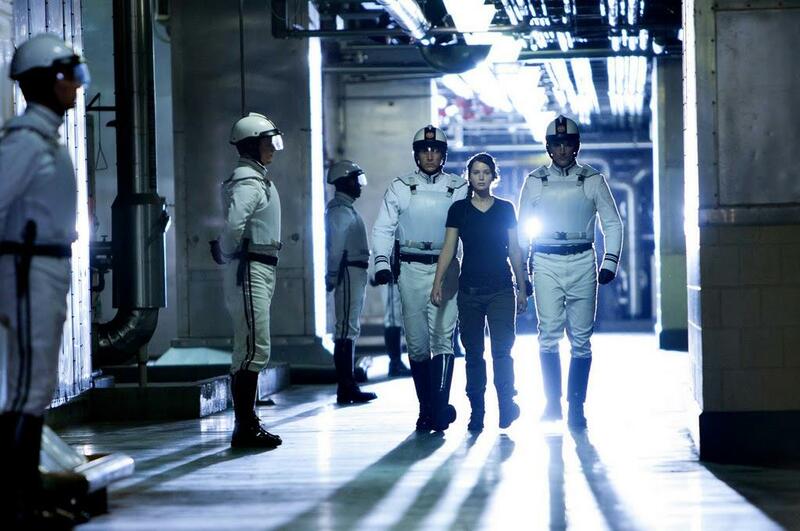 The film is very much a sci-fi/thriller and display of Katniss’ character first, with everything else coming up second. Not a bad thing, but especially given some of the imagery we see and the kinds of emotion that come up on how the characters in the film react, set against how the audience reacts, I wish there was a bit more of a challenge in placing us in a world that should be having us question the nature of a survival game show, featuring children and coordinated by the government. The film may have some effective emotional beats, but at the same time, having the characters and the audience explore more than just visceral reactions might have given more long-term meaning. Haymitch Abernathy: This is the time to show them everything. Make sure they remember you. Some other questionable areas regarding the film: I found issues with its pacing and the mad rush at the end. This film clocks in at around two hours and twenty minutes, which is lengthy. I think the problem with this was not due to trying to fit in things for the sake of fan service, but rather, there is simply a lot of story to tell and Ross in his team were either not quite judicious enough in condensing some elements or not focused enough on expanding some of the more rushed areas that could have better served the film as a whole. There is also the notion of having this film do what it needs to, in order to set up what occurs in the eventual sequels, but focusing on this first feature and finding that proper balance could have been handled a bit stronger. I feel that these issues become quite apparent in the final 10 minutes of the film, which feels so much more rushed than what preceded it. Given that there is basically an extended first act leading to the games, which does a pretty solid job at establishing the stakes, followed by a second game focused entirely on the bulk of the games, there was a bit of an issue with having such a rushed finale in a film that already had length issues. Given that enough setup has been done for the next entries, I can only hope that this problem will be less of an issue next time around. So it sounds like I have been ranting for the past few paragraphs, but this mainly stems from the fact that I really did enjoy this film. Picking it apart is easy enough, only because I had a lot of fun examining the various aspects of it. In truth, I believe there to be so many great aspects of The Hunger Games, that I really would rather not ruin some of that for people and simply say go out and see it. I mentioned that some of the action cinematography was not exactly top notch, but I would still argue that it is quite exciting to watch and be involved in (and there may have been some shaky-cam usage, but I was happy to watch the film in glorious IMAX 2D). I would also say that Lawrence’s performance throughout this film, alone, is worth it, but the addition of people like Harrelson, Kravitz and Tucci (there’s a combo) make it more so. I am not sure how “doing the impossible” would apply to a film like this, simply because I am not quite sure what “the impossible” would be in the case of The Hunger Games, even if it is one of the biggest film events of the year (though the return of that phrase will certainly be debated by the time The Dark Knight Rises comes out). As it stands, however, The Hunger Games did leave me full of anticipation for more, as I got a lot out of this film and found it to be a notable accomplishment. Regardless of the hype, whether or not the book reading the book was important, or whether I am on “Team Peeta” or “Team Gale”, I was simply happy to not only enjoy the film, but be impressed by what I saw; especially since the marketing has done a great job at not spoiling the majority of it. Engaging, smart, and featuring a strong lead performance, The Hunger Games definitely delivered. Effie Trinket: May the odds be in your favor!